Nocturne, Op. 60: What is more gentle than a wind in summer? A beautiful piece that shows the range of the Horn, the skill of the vocalist and the sweet and haunting strings. I played this piece for my senior recital and still love it. 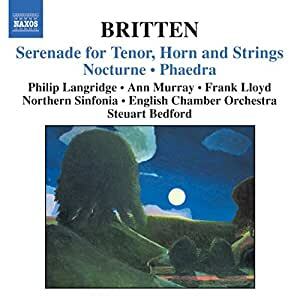 There have been many recordings of the 'Serenade,' starting with Peter Pears's with Britten conducting and Dennis Brain playing the complex horn part. More recently there was a terrific performance by tenor John Mark Ainsley. Langridge's performances of both 'Serenade' and 'Nocturne' are more dramatically apt that Ainsley's, I believe. He uses more vocal shading and acts more with the voice without his sound ever becoming unmusical; his diction is a miracle of clarity as well. In 'Elegy,' for instance, when he sings the word 'sick,' he actually sounds sick, whereas Ainsley seems simply to sing the word as any other. This sort of shaping is heard throughout, and considering the heavy dramatic freight of the marvelous poetry in both this cycle and 'Nocturne' (which is a younger brother, on might say, of 'Serenade'), that is entirely admirable. He is one of the few I've ever heard to actually sound like a cat on the word 'mew' in the Nocturne's 'Midnight's bells go ting, ting, ting, ting.' And yet it is entirely musical. Frank Lloyd, the hornist in the Serenade, is a musician previously unknown to me, but his playing is wonderful. He does not have to take a back seat to either Dennis Brain or Dale Clevenger in their earlier recordings of this marvelous horn part. Ann Murray fills large shoes when she sings the part premièred (and written for) Dame Janet Baker. Yet she does a fine job* with this rather more etiolated song cycle from Britten's final period. The cycle tells the story of Racine's Phèdre in Robert Lowell's verse translation and Murray's Phaedra becomes an impassioned, even wild, character in this performance.. Although full texts are included for 'Serenade' and 'Nocturne,' for some strange reason the text for 'Phaedra' is not included. A shame, although Murray's diction is clear enough that one can catch most of the words. Although this issue is at super-budget price, it is worthy to stand beside any prior recordings of these Britten song cycles, and at this price the nod would, for many buyers, go to it. * Addendum: I've just heard the relatively new recording of 'Phaedra' with Lorraine Hunt Lieberson, accompanied by Kent Nagano, and it simply blows away Murray's performance. Incredible singing, acting, diction, orchestral accompaniment. My strong recommendation of the other two pieces stands. 5つ星のうち5.0Benjamin Britten's Magic Lives Well Beyond the Initial Recordings! There are times when composers write works for specific musicians and because of that 'sacred coalition' all other performances and recordings pale. Such is most assuredly not the case for this splendid re-release of a recording made in the 1990s by Steuart Bedford conducting the English Chamber Orchestra and the soloists Philip Langridge, Ann Murray and Frank Lloyd. Britten wrote the 1943 'Serenade for Tenor, and Strings' for his life partner Peter Pears and horn player Dennis Brain. Though that recording still exists and is excellent, this newer performance by Langridge (who has assumed all of the roles Pears once owned) and horn player Frank Lloyd is in many ways more fresh and delicate and sensitive. Langridge is blessed with not only a lovely tenor voice but also the gift of enunciation that allows every word of the poetry to sing. And the same can be said of the 1958 'Nocturne': Langridge vocal quality at the time of this recording surpasses Pears' gifts of his later years. This is an elegant and soulful performance.